What Do Speed-bumps and Social Security Have in Common? With an election looming in the USA, our airwaves are saturated with attack ads and rampant hyperbole. Among other things, the candidates and talking heads keep rattling on about entitlements and the role of the government versus the private sector. I’ve already voted and I don’t wish to turn Interesting Money into a political blog, so just allow me to create a simple analogy for you by way of a bizarre question: What do speed-bumps and Social Security have in common? Yes, I’m talking about speed-bumps (or maybe you call them speed-humps, which sounds to me like a promiscuous new Olympic sport), those omnipresent vehicle-speed-reducers in mall parking lots the nation over. Do you find them annoying? To most people, I suspect that speed-bumps are a necessary nuisance. They’re inconvenient: you have to slow down and roll over them gently even if no pedestrians, children, or obliviously texting teenage girls juggling shopping bags are nearby. You can always choose not to slow down, but hitting a speed bump too hard can be damaging to your vehicle’s suspension and alignment. On the other hand, can you imagine what mall and apartment parking lots would be like if speed-bumps did not exist? Chaos would ensue, as hormone-fueled adolescents and irresponsible degenerates raced around the area, putting lives and property in harm’s way. Even in my own neighborhood (a subdivision), the need for speed-bumps is evident based on the behavior of a handful of bad neighbors, which includes racing up and down the streets in their cars and on their motorcycles at speeds exceeding 50 mph despite the presence of small children playing on the streets and sidewalks. Two kids narrowly avoided getting killed outside my house last year, causing a brief furor, but the irresponsible behavior hasn’t changed, and our neighborhood still lacks speed-bumps. And this brings us to Social Security, the federal pension system created by FDR in 1935 designed to create a modicum of economic security and guard against poverty in old-age. For those interested, you can read a fascinating history of Social Security here. For the rest of us, we understand how SS works practically: the FICA tax siphons off a small chunk of our paychecks during our working years that eventually flows to the current generation of retirees. When our turn comes and we eventually start to draw SS, it will be the current generation of workers paying the FICA tax who will pay for us. That’s the promise of Social Security, and it thus functions as forced retirement savings, though the actual savings and benefits are offset by a generation or so. There are those in political power who wish to either eliminate or overhaul Social Security completely. That SS essentially functions as a form of wealth redistribution has stuck in the Republicans’ craw ever since the New Deal was passed. Former President George W. Bush called for (but failed to pass) the privatization of SS in which one’s FICA tax dollars would be set aside in an individual private account that could be invested as one desired in the stock/bond markets. Personally, I’m attracted to this idea, as I would relish the opportunity to retain control of my own SS funds. It is, after all, the money that you and I each earned, so it should be our individual responsibility to manage it wisely, accepting whatever gains and losses our investment decisions procure. Provided that our SS accounts could operate like the best 401(k) plans out there with a variety of low-fee funds and no transaction fees, I would much prefer to take responsibility for my own investments. As liberal as I tend to be on social issues, my personal desire to see Social Security privatized is one viewpoint I have in common with the Republican party, but this brings us to the analogy and answer to the original question posed in this article. 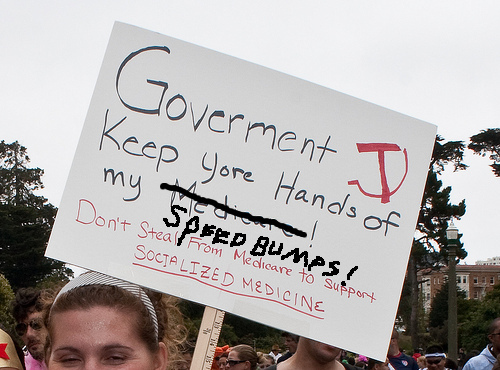 So, what do speed-bumps and Social Security have in common? They both serve an indispensable purpose that benefits society as a whole even while inconveniencing certain individuals. A world without speed-bumps would prove disastrous, as would America without the pooled safety-net resource of Social Security. I mentioned above that I would prefer to see SS privatized, though I also recognize that this is ultimately a selfish viewpoint. While I do feel confident in my ability to manage my own SS dollars, I accept that most people would end up making horrendously stupid decisions, squandering the money in the process. Lobbyists for Wall Street would also undoubtedly bribe Congress to allow for Social Security loans – à la borrowing against one’s 401(k) – thereby giving desperate retirees even more rope with which to hang themselves. No, privatizing SS would benefit people like me, but would ultimately be harmful to society. People like my grandfather-in-law, who didn’t save a penny for his own retirement and is living meagerly off the goodwill of family members plus his monthly SS check (while railing against those damned Socialists in the White House, mind you) would be out on the street if it weren’t for the “shared responsibility” version of Social Security in place today. I therefore gladly welcome the presence of both speed-bumps and Social Security pensions, and I accept whatever individual inconvenience each may provide. As James Madison wrote, if all men were angels, no government would be necessary. Likewise, if all citizens were respectful and responsible, there would be no need for speed-bumps or Social Security. Since we live in the real world and not in fairy land, I’ll continue to support both. Hey Government! 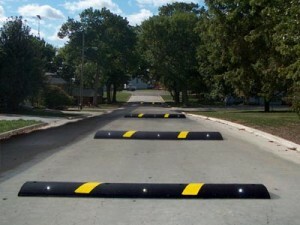 Get your government hands off my speed-bumps!